As the canal has come to life and more of Phase 1A has become navigable, it has witnessed an explosion of interest, participation and engagement. Indeed, the level of use the community has shown as the regeneration has taken place is very encouraging and heartening. Whilst SVCC bears the responsibility and cost for maintaining the canal, currently most of the beneficiaries of the restored canal do not pay for their use. Nevertheless, Phase 1A is already a success judged from opinion polls taken from the wide and diverse range of users. With the restoration and in some cases recreation of a wide and sturdy towpath along much of the canal, a wide range of people have taken to using it as their prime source of exercise. Joggers, walkers, cyclists, dog-owners, those with push chairs and in wheelchairs have all flocked to the canal to enjoy the flat, well-constructed and attractive towpath that runs practically continuously from Ocean to Brimscombe. A casual visitor to Stroud would see people of all ages, and all cross section of the community mingling in harmony as they enjoy the newly created tranquil and attractive corridor through Stroud. 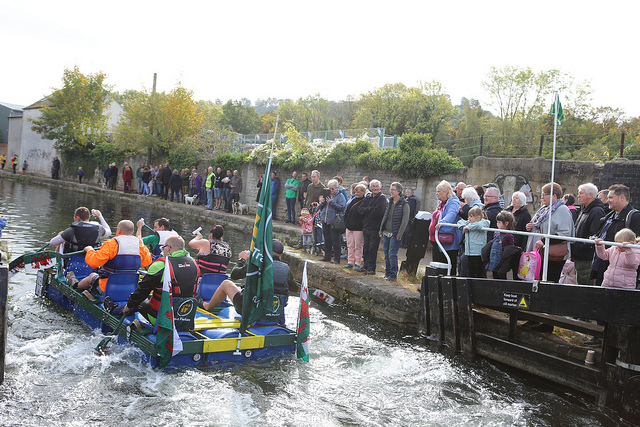 Many groups and organisations have embraced the canal as a new and beneficial asset to the area and have thrived. Existing canal users such as the canoe club or angling clubs have seen a growth in membership and participation, whilst other organisations have seen the benefits of the canal and used this newly created facility. This is demonstrated by Stroud Running Club using part of the towpath for their annual fun run. Individuals have also changed their lifestyle to use the canal. Many people now use the canal to get to work and what a relaxing and therapeutic commute! Mums with toddlers can push their prams side by side along a safe and pollution free environment with young children communicating with nature. The canal provides a vibrant and splendid natural backdrop with the return of a wide range of species. With strategically located and clear information boards, the visitor to the canal can be taken along a natural trail from town to country. Quark Boards also tells the story of the history and heritage of the canal and its people in a graphic and clear way.